On this site you will be able to find Adler news, the calendar and picture Galleries. 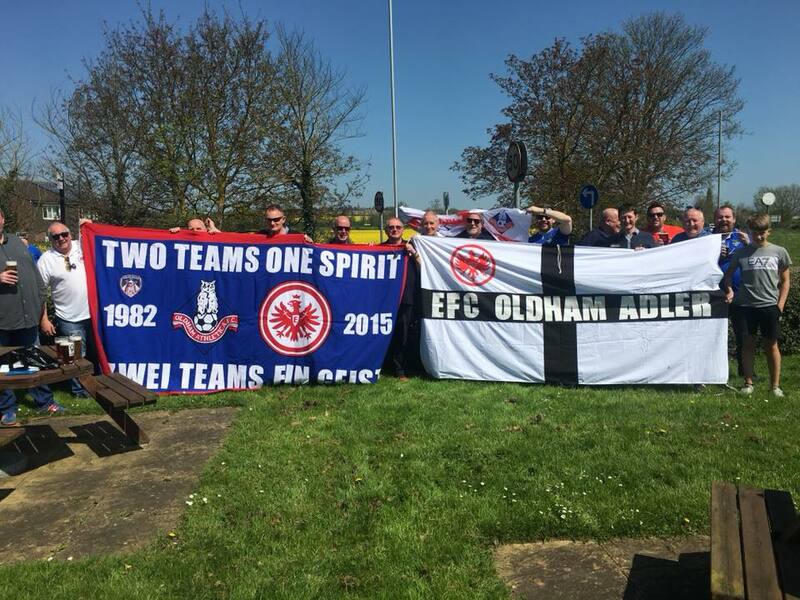 The friendship between the fans Of Oldham athletic and the SGE now dates back more than 30 years, and through the fan generations this relationship is well kept and still very strong. At the Start of the 1980s Eintract fans were experimented on the pitch, playing in supporters tournaments nationally and internationally. This is where the owl and eagles story begins…. The French were astonished, when the “Booze-Brothers” –as Thomas called the groups, played in the Final. Bockenheim won the final against Oldham, and the Party after was Immense. Both Finalist enjoyed the after party and the French were not amused. The party continued on the joint campsite, and the first addresses were exchanged. IN September 1983 Bernhard Schulze and his friend Paul Duong were the first Frankfurt supporters to come to England to visit their new friends. They did the journey via train, calling at Cologne, Ostend and Hull towards Manchester then eventually Oldham. However, they “forgot” to inform their hosts of their trip which was due to last several days. Owls-Fan Colin Shaw even gave a warm welcome to this little Frankfurt delegation and showed them Oldham and its surrounding’s during the next days. I must have been a very big occasion for him to visit, together with his guests from Frankfurt a match at Old Trafford. Even though it’s a location disliked by Latics fans. The highlight of the trip was a meeting with then Latics manager Joe Royale who personally welcomed Bernhard and Paul from Frankfurt, then presented them a football with all players’ signatures and also tickets for the next match. Frankfurt returned the kindness by presenting a pennant from EFC Bockenheim which found new home in the Latics trophy cabinet. In the following years more visits of this littlw Frankfurt Delegation to England took place, the first trip to the Continent started in 1988. This is when England played in the European Championships in Germany. One of the England games was in Frankfurt, a 3-1 defeat to the Soviet Union with Colin Shaw and Graham Fowler turning up for the game. The Frankfurt fans organized the travel arrangements and were all visitors to several matches, to witness another England tournament disaster. As prices of air fares became cheaper in the 1990’s this lead to more meetings and trips being organized. In Frankfurt more and more people heard more about the events in a little corner of north west England and from time to time the well known faces of Clemens Vesely, Jörg Heigel, Stefan Faulstich and other SGE fans were seen in Oldham. 1998 saw a first, an trip from Frankfurt made up of 3 supporters clubs : Rhönadler, Bockenheim and Griesheim. They came over for a cup game at Cardiff city unfortunately Latics lost 1:0, however after the game the Latics fans announced they were planning a visit. So the Frankfurt fans decided to make it extra special, they organised it for the last game of the season May 29th 1999 which turned to be one of the greatest games in Frankfurt history. Approximately 30 Latics fans made the journey, and joined in on everything including a pitch invasion, wild parties in the fan zone and in Sachsenhausen. Up to present days’ regular groups of Frankfurt fans, come over to watch Latics and to drink with their friends. 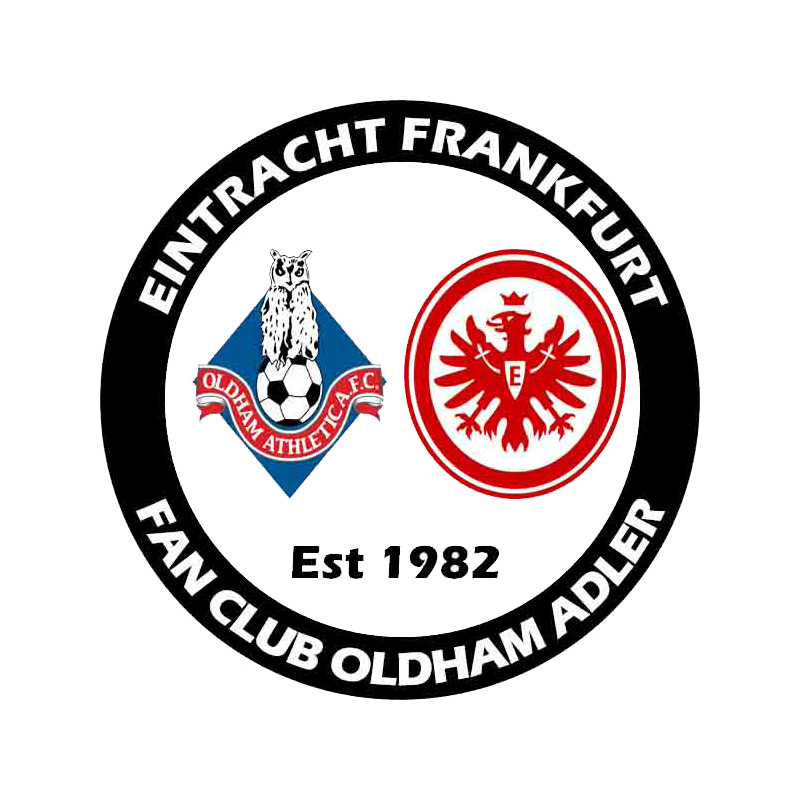 While Oldham fans go the other way to Frankfurt to see matches, enjoy genuine Frankfurt Christmas markets or to have a great meal at Stefan’s Hotel. But unfortunately there are also sad days. One his way to the German cup final in Berlin, Colin, one the “fathers” of the group died to an embolism. His Frankfurt friends waited for him at the arranged meetings point and never showed up. The fans went to the ground with a very ill feeling. The Frankfurt-Latics fans received the news on route to the Olympic stadium, this made the trip a sad one. Frank Sypula, involved in this friendship since the 1980’s, died after an accident in 2009. Clemens Vesely, one of the faces of the Bockenheim fan club passed away in 2013. At all the funerals were well attended from both clubs, giving their friends a last farewell. We will be having a fans team photo with the official black and white cross EFC Oldham Adler flag this saturday at the greyhound in royton about 2.00. The flag will then be returning to Frankfurt and will be displayed at seleted games. Well its that time of year again, the new season is upon us! The Owls start life in league 2 rebuilding after last seasons relegation campagin. The Eagles are however still soaring high after last seasons cup victory and have European football to look forward to!